The April 1 edition of Tuesday Funk found co-host Andrew Huff reading his ripped-from-the-headlines haiku once again. Well, at least in fits and spurts. Only two months till fall! Not when your host dies. has struck off northern Chile. Spring might have felt like a cruel April Fool's joke, but Tuesday Funk #68 was all real, baby. 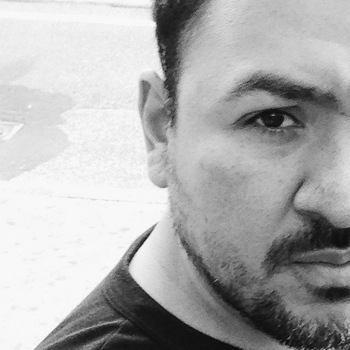 Cesar Torres gave us a glimpse into his soon-to-be-released serial novel The 13 Secret Cities with a breathless chase scene in a dystopian Chicago. Letitia Moffitt read a humorous and bittersweet story of a young woman changing her appearance to forget her past, from her novel-in-stories Sidewalk Dancing. Co-host Andrew Huff shamed Chicago for its 4% primary turnout in haiku. And Amy Sumpter rounded out the first half with the true trials and tribulations of a Girl Scout roadtrip gone horribly wrong. Co-host Eden Robins made us all think about aging with her micro-essay. Brooke Wonders took the stage with two stories - a horror love story (is there any other?) and one about writing, if stories were wild animals. And finally, Jill Howe chilled us to the bone and then warmed our hearts with her scary, sweet, funny, sad tale of teaching at CPS. We tried to hold onto the moment for as long as we could, but all good nights must end. That doesn't mean we can't have another! Join us on May 6th for Tuesday Funk #69, featuring James Finn Garner, Melissa Wiley, Gint Aras, Jeremy Owens, and Dustin Monk! Reminder: Tuesday Funk #68 is tonight! Well, slap a fish on my back and call me a poisson d'avril... tonight's Tuesday Funk is no joke! We promise, only 5-10 bad April Fool's puns per hour. So come by Tuesday Funk #68 and see fabulous readers Letitia Moffitt, Brooke Wonders, Cesar Torres, Amy Sumpter, and Jill Howe... and of course your charming and humble co-hosts Andrew Huff and Eden Robins. 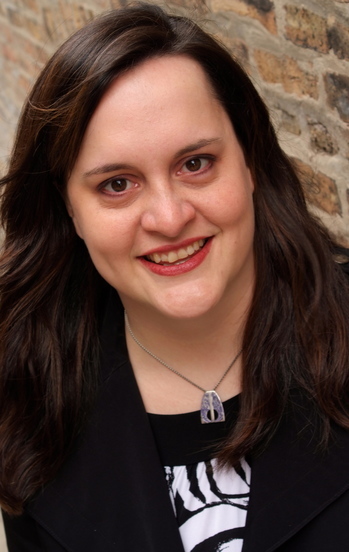 Amy Sumpter is a comedic actress who has does stand-up all over the city. She is a regular performer with The Kates and Beast Women. 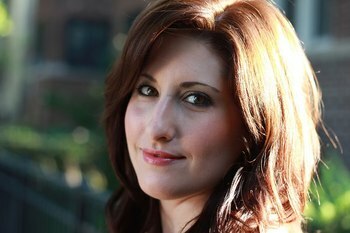 You can find her on Rooftop Comedy.com and she will be at Zanies in May. She is also one third of She's Crafty, Chicago's all female Beastie Boy tribute band. Please join Amy and all our other amazing and beastly readers on Tuesday, April 1, 2014, upstairs at Hopleaf at 7:30 pm. This 21-and-older event is free. Cesar Torres is the author of the 2010 short story collection The 12 Burning Wheels. His first published short story appeared in The Willows Magazine in fall of 2008. His brand new serial novel, The 13 Secret Cities, releases April 28 of this year. Cesar is also the host of The Labyrinth podcast, where he interviews authors and explores topics in writing, philosophy and publishing. He lives in New York City. For more details about The 13 Secret Cities, please visit 13secretcities.com. Please join Cesar and all our other secret-keepers on Tuesday, April 1, 2014, upstairs at Hopleaf at 7:30 pm. This 21-and-older event is free. Brooke Wonders' fiction has appeared in Clarkesworld, Electric Velocipede, and the Year's Best Dark Fantasy and Horror 2013, among others. Her nonfiction has appeared in or is forthcoming from Brevity, The Collagist, DIAGRAM, and elsewhere. 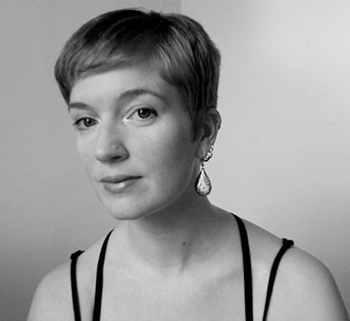 She reviews for American Book Review and serves as nonfiction editor at new online literary magazine The Account. She will soon be receiving her PhD from the University of Illinois at Chicago, and her blog can be found at girlwonders.wordpress.com. Please join Brooke and all our other pre-doctoral readers on Tuesday, April 1, 2014, upstairs at Hopleaf at 7:30 pm. This 21-and-older event is free. Letitia L. Moffitt was born and raised in Hawaii. She received a doctoral degree in English/Creative Writing from Binghamton University, and she taught creative writing at Eastern Illinois University for six years. 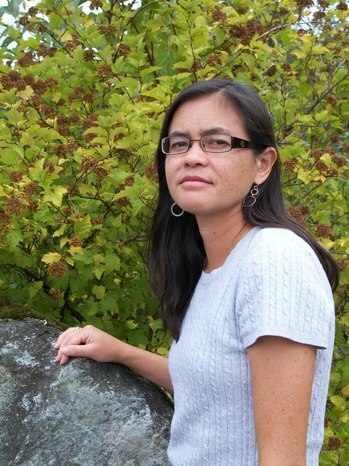 Her works include a novel-in-stories, Sidewalk Dancing (Atticus Books, November 2013), as well as short stories, essays, and poetry published in literary journals including [PANK], HTMLGiant, Black Warrior Review, Aux Arc Review, Dos Passos Review, and many others. Please join Letitia and all our other well-rounded readers on Tuesday, April 1, 2014, upstairs at Hopleaf at 7:30 pm. This 21-and-older event is free. Jill Howe has turned story love into a super power. She organizes fellow writers in sharing their latest written work at her monthly workshop, Friends with Words, while also co-producing Story Sessions, a monthly event hosted by Deanna Moffit with true stories, bluegrass music, story-inspired artwork, and hugs at City Winery and Mahoney's. The next installment of Story Sessions is on April 27th at Mahoney's. Jill has shared her nitty-gritty at Mortified, Reading Under the Influence, Story Lab, Chicago Solo Theatre, Ignite Chicago at the 1871 tech lab, Essay Fiesta, Story Club Bridgeport and many more. Most of all, she can't wait to hear your story. Join in the story fun at www.storysessionschicago.com. Please join Jill and all our other fabulous storytellers on Tuesday, April 1, 2014, upstairs at Hopleaf at 7:30 pm. This 21-and-older event is free. No foolin', the next edition of Tuesday Funk is on April Fool's Day. Expect a typically eclectic show with readings by Letitia Moffitt, Brooke Wonders, Cesar Torres, Amy Sumpter and Jill Howe. Eden Robins and Andrew Huff are your humble cohosts. 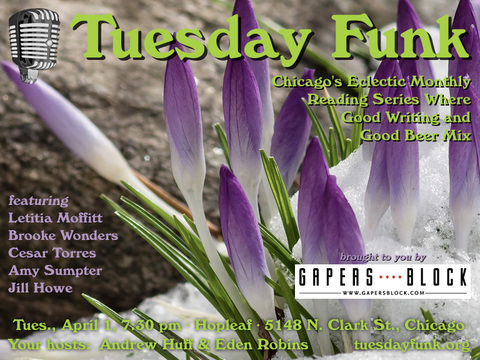 The evening gets underway on Tuesday, April 1, 2014, at 7:30 pm in the upstairs lounge at Hopleaf, 5148 N. Clark St., Chicago. Doors open at 7:00 pm sharp, no earlier -- arrive early for a table and grab a beer from Mark at the bar. As always, admission is free, but you must be 21 or older. And come early or stay late after for some great Belgian-style food downstairs. RSVP on Facebook and bring a friend. And hey, become a fan of Tuesday Funk on Facebook so you never miss an invitation to one of our readings. See you there! This page is an archive of recent entries in the Reading # 68 category. Reading # 67 is the previous category. Reading # 69 is the next category.